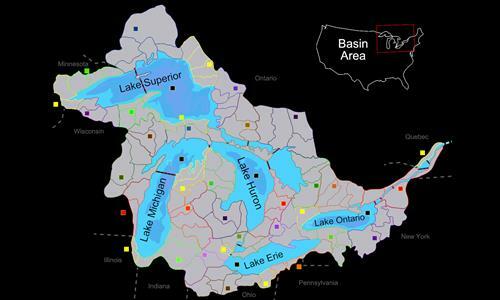 The Great Lakes contain %21 of the world's fresh water and is home to 8 port cites with more than a million people: Toronto, Chicago, Detroit, Montreal, Cleveland, Milwaukee, Buffalo and Ottawa. 85,000 cubic feet per second pass over Niagra Falls (the outlet to the great lakes). This is a map of that drainage basin. *Bonuses are based on drainage basins, not political boundaries. Review by Nathan on 7/8/2014. Great map and an intriguing division of territories. Very interesting. Thanks, fixed them. I will be releasing a 2.0 after doing some other quick changes. Review by Dr. Stupid on 7/9/2014. Great Concept! I like this map. Nice map! Try to start in the middle - challenging! Review by Judeburger on 6/14/2015. Nice artwork and background. Fun map with narrow choke points but balanced with some open areas. Review by warhawk on 11/5/2018. Map played well in a 4v4 match. All connections are good.